The quote I’m thinking about today: “When I’m working on a problem, I never think about beauty, but when I have finished, if the solution is not beautiful, I know it is wrong.” R. Buckminster Fuller. Although I am a fan of Bucky’s, I do believe Mr. Geodesic Dome and I disagree that beauty is right, Grecian urns excepted. I was looking out the window at my neighbor’s pink roses and thinking how people say that problems have a way of finding you, which led to, if that’s true, then so does beauty. I mean, those roses are seriously intent on getting my attention—and clearly they have because I’m writing this post about them—but couldn’t someone just as easily view these pink lovelies as a problem? Beauty is a choice. Perhaps, right and wrong are, too. C offee, jazz, and a little Sunday morning philosophy…I am restored. If you are unfamiliar with Astrud Gilberto, do yourself a favor and spend an hour or so with this lovely Brazilian bossa nova singer probably best known for The Girl From Ipanema. Anything she does is delicious, but I particularly like her rendition of Agua De Beber. The lyrics are a little cheesy in English–your love is the rain, my heart is the flower, give the flower some water to drink–thankfully, Astrud sings it in Portuguese. Water to drink. Agua de beber. A metaphor that begs the question, what restores you? Coffee? Jazz? A fabulous painting? The Sunday crossword? The love of a good [fill in the blank: man, woman, ginger tabby]? A five-mile run? The smell of old books? Harry Bingham’s latest Fiona Griffiths novel? A full-bodied pinot noir? A full-bodied [fill in the blank: man, woman, well, er, maybe not a ginger tabby]? Conversation with friends? Whatever it is, it’s important to know how to restock your shelves because a life well lived periodically depletes the warehouse. One of my art school pals asked this morning on Facebook: What are five things you would tell your younger self? Most of the responses went something like, I wish I had finished school when I was 25 instead of 50, bought xyz stock so that now I’d be a millionaire, gotten married, not gotten married, been more confident. The money thing is tempting–not because I need more bagatelle, just the freedom to make art–but, ultimately, I wouldn’t tell my younger self anything. She did fine and I don’t have regrets. Do I think my life has been flawless, that I was always kind to the people who deserved it? Hell, no. Have I experienced hardships and tragedies? Yes. More than some, fewer than others, but, yes. And I wouldn’t change a thing. First, who’s to say a straight line to anything is better than an organic, circuitous path? A straight line might get you there faster, but all the experiences and relationships you’d miss, even and especially the painful ones, are probably more important. In his book, The Prophet, Kahlil Gibran says, “The deeper that sorrow carves into your being, the more joy you can contain. Is not the cup that holds your wine the very cup that was burned in the potters oven? And is not the lute that soothes your spirits the very wood that was hollowed with knives?” Our capacity for happiness and empathy come from struggle, not harmony. And so it goes. We empty our shelves and then we restock. Maybe art is a matter of taking honest and accurate inventory. How does a particular piece of art relate to previous work in the same genre? In different genres? Does the artwork exemplify its own time period? Artists use historical context to engage each other in the dialogue. In this regard, every painting, sculpture, and performance is in a tête-à-tête with every other piece of art, whether the other pieces were made a thousand years ago, a century ago, this week, or hundred years in the future. If a piece isn’t participating in the conversation, then it’s decoration or documentation or some other thing, but not art. As artists, we each have a voice in this art conversation. How interesting and relevant our voice is depends, in part, on how well we know and understand the other participants. If I don’t know that Mondrian deliberately maintained a limited palette, then my paintings are excluded from a potentially enlightening debate. And I’m sure you’ve been in discussions where someone says something that has already been articulated. It’s a little tiring because it doesn’t add to the conversation and makes everyone have to stop, repeat, rebuke. Conversations need to move. Whether the participants are fleshing out a particular thread (depth) or exploring new topics (breadth), the exchange must be lively in order to be note-worthy. Contemplate, question, discuss, argue, debate, thrash out: these are all action words. So, when artists think about their own work and how it fits into the art conversation, they have to ask themselves a few questions: Am I just repeating something somebody already said? Am I trying to develop an idea begun by one or more other artists because I think there’s still conversation there? Am I trying to start an entirely different exchange? For me, artists seem to either seek expertise (they want to do it better) or exploration (they want to do it different). Because our culture puts a premium on innovation, artists are pressured to find increasingly original ways to express their ideas even though we need depth as much as we need breadth. Gifted and accomplished artist John Millei explained during an orientation week artist’s talk at Claremont Graduate University that he thought of himself as “a sustainer not a rebel.” To his point, most artists probably are sustainers. I mean, if everyone were a rebel, no one would be a rebel. Mozart, a certain genius, was a sustainer. He did it better to the extreme, but he didn’t change the music of his time. On the other hand, Beethoven revolutionized the composition of classical music; he was an explorer. Both are good; both are necessary—and both offer interesting and relevant input to the discourse. Regarding my own work, I believe I am deepening an existing conversation in ways not available to the originators. Hard edge, reductivist painters of the late-1950s, early-1960s fleshed out pretty well the form. I’ve extended that part a little, but not much. What I have done, which was begun by Sol LeWitt, is some serious work on the content. LeWitt began to create a bridge between minimalism (which sought to remove content) and conceptualism (which is all content) with his wall drawings and artist’s diagrams. I believe I have found some interesting and relevant ways to talk about perception and meaning that result in a minimalism-conceptualism hybrid. Whatever it is, it’s a fascinating conversation, don’t you think? Close Encounters of the Third Kind came on the telly this evening so I left it running while I was finishing up the budget for a grant proposal. I’ve been reading this murder mystery that takes place in Wales, which makes me say things like “telly.” Not sure why, but reading has always been a full-contact sport for me–mental and physical. In real life, I often feel like I’m standing just on the edge of things, observing. But in books, I’m always in situ. I finally gave into the cravings for rice and eggs after a few days of reading Clavell’s King Rat because all the POWs were only ever served rice and eggs. It’s not always convenient, but it certainly makes reading more vibrant. Back to the telly. I’m not always keen on background noise, in fact, I’d say I alternate fairly evenly between clamor and silence when I’m trying to get things done. But today happened to be a noise day. Sometimes, noise days are iPod-generated with a single song set on repeat. I’m always pretty busy inside my head–most artists are–and having an easily-dismissed-but-constant-uniform sound helps me focus. I am not ADD or OCD or whatever other string of letters might describe this behavior, just a busy thinker. Anyhoo, an interesting thing happens in Close Encounters, something I really hadn’t put together until now. (I saw the movie just as I was entering my banking phase, long before life as a professional artist.) The story culminates with humans encountering and departing–presumably back to the home planet–with aliens. Sorry if I spoiled it for you, but the plot is pretty much disclosed in the title. Leading up to the inevitable finale are signs and communications, alien travel confirmations and ETAs, if you will. The interesting part is that these communications come as drawings and sculptures. One woman is obsessed with sketching what turns out to be Devil’s Tower in Wyoming. 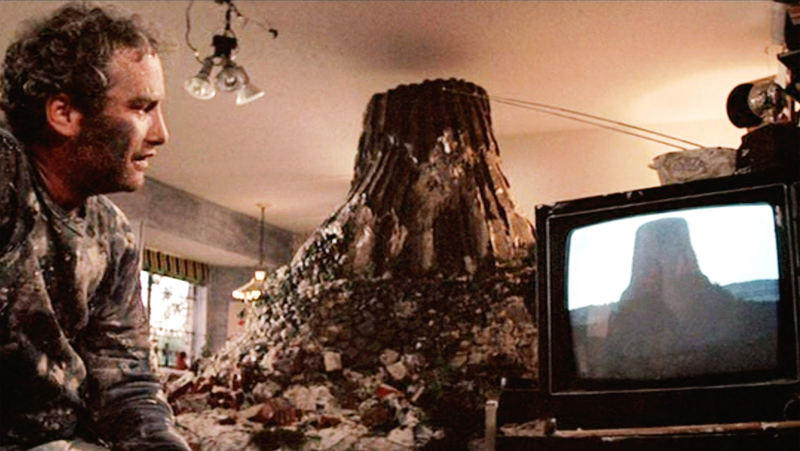 And who can forget Richard Dreyfus’s mountain of mashed potatoes, which is just a preliminary model for the nine-foot mud-version in the middle of his living room. Maybe aliens speak to humans in this way because the art-brain is more receptive to connection and less encumbered by expectation. I know this sounds a little wacko; I don’t think that’s what we’re dealing with (save the obvious Dali-ites who relish the wacko label). Fundamentally, artists act as a kind of surrogate for society–we do what others cannot or will not. We express sensitivity and vulnerability, we expose and consider the things others turn away from. It is an artist’s job to grapple with fear, discomfort, and inadequacy in order to lead the examined life, disturb the peace, and make our discontent everything except quiet. Art is, by definition, unsettling–like mud-mountains in the living room.